Should you take the NYC sybway? Well, you certainly can. Sitting in the subway is a typical New York thing, with the typical carts and the typical phrase “"stand clear from the closing doors". It is not scary and it is THE means of transportation in NYC. It gets your from A to Z quick and comfortable. Daphne will laugh when reading this and she’ll say "Esther always prefers traveling by cab". Which is true and I’ll explain why. I just don’t get the subway system. Even after all those years. No doubt that that’s my bad (I’ve written it before; I still get lost in my own town). I’m ok as long as we go in a straight line from downtown to uptown, but mostly our days in New York are not that basic. Our itinerary often sends us from A to C, via Z so that we can stop at Y and Y2 in between. Which usually means taking different lines where you sometimes have to walk 10 minutes to get to another platform. The subway system in NYC is hard to see through, many times you just "have to know". And then, when we’ve reached our destination and I make it to the top of the stairs, I always have to figure out which way is uptown and which way is downtown. Smartphones with gps make life a little more easy, but I still have to figure out every time how to get to the right address. I’m a somewhat impatient person and therefor not always in the mood for these “problems”. Plus, cabfare in New York is very reasonable. But I herewith promiss Daphne that from now on, on the easy straight up and down rides, we’ll take the subway! Apart from the subway you can also take a bus through the city. It’s fun to get on a bus that takes you all the way through town. You can get on uptown and stay on until you reach downtown and see a lot while you’re comfortably seated. They’re also great to get out of town. The outlets The Mills at Jersey Gardens or Woodburry Outlet are easy to reach by bus. You depart from the Port Authority Bus Terminal, the biggest busstation in Manhattan. When you purchase a ticket with one of the cashiers (which are sometimes like the JFK customs, but sometimes very sweet) you get directions on where to go. Very easy, also for public transfer nitwits. Almost forgot about the trains. But really, you don´t use it a lot while in NYC. Or at least, we haven´t been on a train a lot. We´ve taken a train once, when we arrived at Newark. Took it on the way back aswell, by the way. And one of the things on my “next-time-I-go-to-NYC-I-would-like-to” list is take the train to Washington. But since there’s never enough time to do the things we want to do in the city, I seriously doubt that that will ever happen. But one of the things you should definitely go see when your in New York City, is Grand Central Station, very impressive! 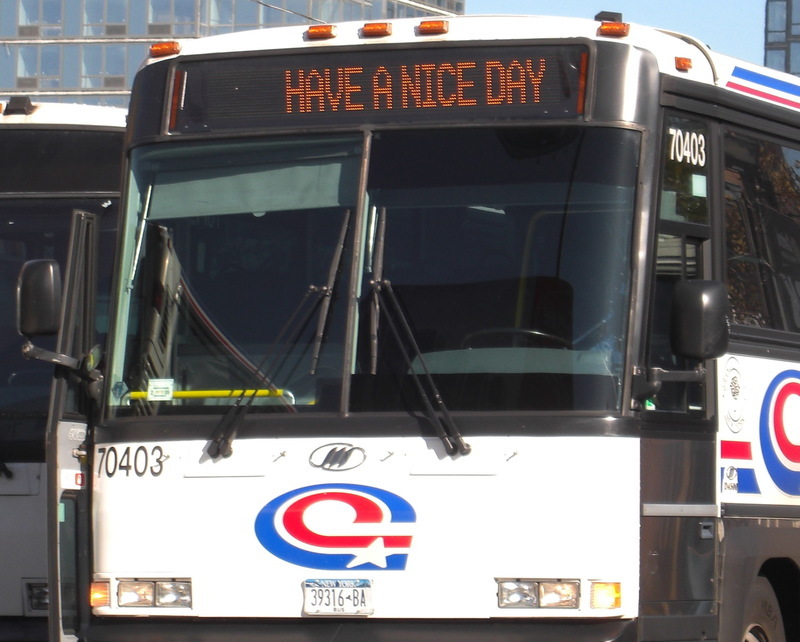 Check MTA for more info on busses, subway and trains. I just noticed that they also offer a routeplanner; perhaps something for this Newyorkcitytripper to check out….